This review looks at challenges and potential ways forward in photographing journeys -issues I became interested in Assignment 2 but were left pending. It looks at ways I might approach ‘journeys’ in Africa and Asia, compared to the way I photograph journeys in UK – supposedly my ‘own’ society’. It briefly considers issues of ‘colonial gaze’ and travel photography. But it is more concerned with wider issues of tensions between subjectivity and objectivity in landscape photography, and the implications for an ‘enlightened’ and relatively informed approach to photographing journeys as a process of exploration and discovery, then selection and interpretation – inevitably raising political questions about what I am photographing and why. It makes substantial use of my own photographs of journeys taken before and during my work on this course, placing these in the context of other African and Asian photographers as well as Western photographers who have depicted similar landscapes both as studied ‘documentary landscapes’ and as journeys/journey narratives. This review is partly a way of taking stock of the photographs I have and how they can be made more meaningful through selection, processing and narrative sequencing. Partly a way of comparing my images to those of professional photographers who have dealt with similar types of images. It raises continuing issues to consider in my practice going forward in relation to any documentary photography: what am I trying to say, to whom, and why? The answers will vary depending on the types of journey in question – requiring careful thought about techniques that can be used in any one physical setting (light conditions, speed of travel, distance from subjects etc) and also the selection and sequencing of images as a narrative. In Assignment 5 I will experiment with different types of narrative that can be constructed from the same sets of images. Rwanda: Gisenyi to Muhanga (May 2013) These were taken as one of the exercises for Gesture and Meaning Assignment 1 Documentary as an experiment in manual focusing. I used a zoom lens setting the ISO at 400-640 and aperture mostly at f/6.3 to get a reasonable depth of field. However from time to time I varied this when speed or distance made images too blurry. I found this technique interesting, and some of the blurry images quite atmospheric in their ‘rapid glimpse’ effect of people going past. But – partly because of my eyesight – I find manual focus difficult, and the approach rather too hit and miss. Kenya: Thika to Nairobi airport (January 2015) Here I used a similar approach as for Cote d’Ivoire. I was struck by the interesting names of shops and hotels. The light was much brighter so I fixed the aperture at f/10 to give greater depth of field. However this proved too slow for many of the images, making them blurred. In this case (unlike Rwanda) I find it annoying. I think because the subjects are further away. I think this could be edited down and the photos themselves edited into a series focusing on shop signs only. Cote d’Ivoire: Zaranou to Abidjan (August 2015) Photographs were taken frequently as soon as I saw ‘interesting’ images – mostly people, but also as I noticed more and more patterns I started to collect images of the innumerable billboards of women’s cosmetics and electronics – as well as rubbish and bad housing. They were taken at ISO400 with a 28mm wideangle fixed lens. In the town I fixed the aperture at its widest: f/1.8 to allow maximum shutter speed for the dull rainy season light – together with the fast car. Meaning that I had to be quick to focus exactly where I wanted for each image. I find quite a few of these images quite evocative in the contrast between sharp and blurred areas. This maintains the feeling of travelling, whilst still giving some focus. I could exploit this more with practice to create more deliberate meaning. Indonesia : Sumatra (April 2016) The Portfolio images were taken in the conventional way – selecting the ‘picturesque’ while travelling or on travel stops while my Indonesian photographer friend also took photos. The Journey images experimented by taking photos at regular intervals while going through villages and urban areas – counting 10 between each press of the shutter and pointing in the same direction – giving a much more automatic random sequence. These are probably more ‘representative’ overall and did give some interesting images. It is interesting how many of the images have no people in – they were all in the fields at this time of day. Also the numbers of satellite dishes. On balance though I think that the approach in the Cote d’Ivoire sequence is more effective. 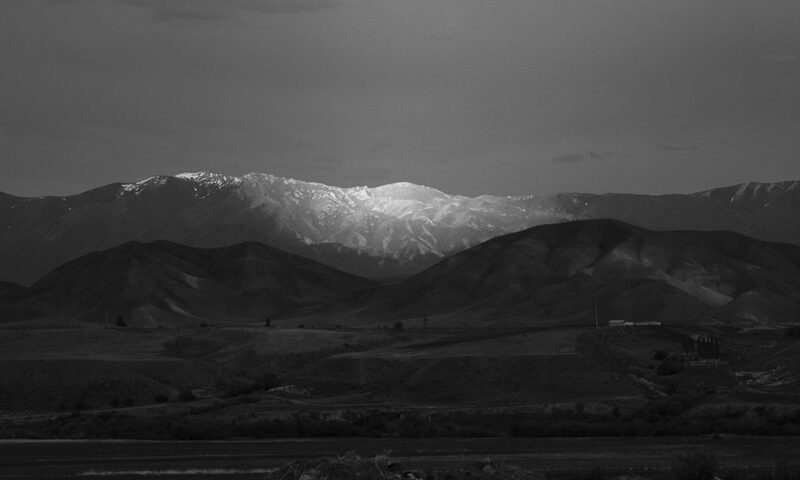 Kyrgyzstan (May 2016) This is my most recent series – reverting back to the method from Cote d’Ivoire but with an aperture setting of f/3.2. I maintained as much sharpness in all the images as possible – despite the unpredictable bumps in the road), often through shooting forward through the windscreen (atmospherically cracked). But I exaggerated the feeling of journey through including the window frame and cracks, as well as the driver in some of the images. On the whole I find Kyrgyzstan the most successful of the series – along with Cote d’Ivoire. This is partly because of the subject matter itself. But also because keeping the aperture setting constant I can focus on the image. But in both taking and selecting the images I need to think carefully about what it is I am trying to say – I am not a neutral observer and it is important not to perpetuate stereotypes.